Watermelon not only tastes great, but it’s good for you too. Did you know watermelon can help relieve sore muscles? Try juicing some watermelon before your workout. Watermelon contains 1-citrulline, an amino acid that helps protect muscles and prevent muscle pain. Eating watermelon has been shown to reduce high blood pressure because the citrulline converts into nitric oxide. This is essential in keeping blood vessels relaxed, allowing blood to flow freely. The biggest benefit of watermelon is what it does for your skin. It prevents aging, moisturizes, and is a natural toner. 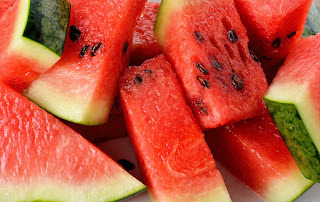 Watermelon also removes excess oil on the skin, and can cure acne and relieve sunburn! 1. Blend the watermelon (seeds and all) in a blender or mixer. 2. Add the watermelon to the container for storage and mix in a teaspoon each of witch hazel and distilled water. 3. Apply the toner to clean skin. It can be stored in the fridge for up to two days. Whether you eat it or tone with it, enjoy your watermelon!